Our little blue house is always on the look out for new ways to use blackberries. I found the recipe below for Southern Blackberry Cobbler in the Food Section of our local paper last July. It was taken from a recipe book by Joan Allers entitled, Cider Beans, Wild Greens and Dandelion Jelly: Recipes from Southern Appalachia. Although not my Gramma’s Blackberry Pie from my childhood, this Southern Cobbler sure fits the bill. It is quick and easy, taking only 30 minutes to bake and about 5 minutes to throw together. Plus, I happen to know that my sister buys frozen blackberry cobbler for her husband. I am hoping this one makes it into her Keeper Box and she never has to thaw one out again. You will be amazed how elegant this super easy dessert can be when served over vanilla bean ice-cream with a basil leaf garnish on top. The crust of the cobbler is a golden, flakey delight. 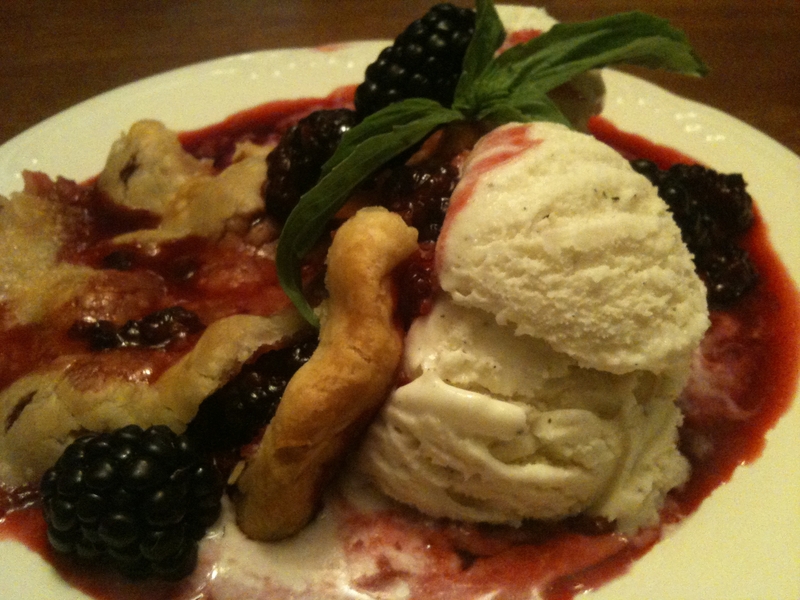 The warm bubbling purple syrup and concentrated berries sweetly compliment the creaminess of the ice-cream. Be sure to take the extra step of brushing the top of the pastry with milk and dusting with sugar. It gives a special rustic quality to the cobbler. Besides, what kid won’t break into a big smile when they notice the sparkling sugar crystals that top this winning dessert? Pour the berries into a 9-inch square baking dish. Mix together the ¾ cup sugar, cornstarch and salt in a bowl. Sprinkle the mixture over the black berries. Dot the top of berries with the butter bits. Place the pie crust over the berries. Seal the edges against glass dish. Cut several slits in the top to allow steam to escape. Brush with milk and sprinkle crust with 1 tablespoon of sugar. Bake for 30 minutes at 425 degrees until crust is golden brown. Serve warm or at room temperature over vanilla ice-cream. Garnish with Basil or Mint leaf, if desired. Recipe found in Wednesday’s Food Section of Daily Herald. Original recipe from Joan Allers’ cookbook entitled, Cider Beans, Wild Greens and Dandelion Jelly: Recipes from Southern Appalachia. This looks SO good… I’m going to try to alter it into a gluten free recipe… Wish me luck! So nice to meet you in line at the checkout! Good Luck. Please let me know how your gluten-free version goes. I’d love to find out.